The Giant rooster wowed the crowd in the nursery. THE animal nursery at the Mount Larcom Show was a little touch of heaven for Bajool youngsters Casey and Joe Taylor who found plenty to delight their senses. Connor their mother was easily swayed in helping them invest in some prime livestock that had come up for sale on the market. 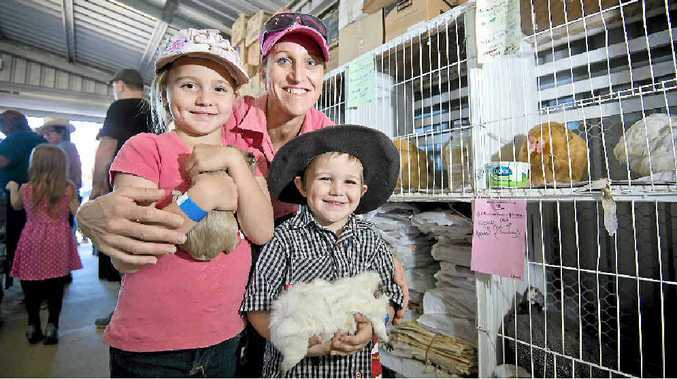 After a quick check of their breeding line and sturdy legs, Casey, 7, and Joe, 4, did a great deal with mum's loose change and took home a pair of very cute guinea pigs. With the deal fully sealed, young Casey explained that she had really wanted one for quite a while. "She (mum) might let me take them inside if they don't poop so much," she said. "I've got chooks but they peck me. "The rooster that's mine pecks me so we are going to swap it." Joe had already named his new best mate "Scruffy" but what the very fine little four legged fellow, who was far from unitdy but rather neat, thought of that well he didn't say. Mrs Taylor said the children already had horses, ducks and a few other animals at home but with birthdays soon coming up the two guinea pigs were the gifts. One of the great things about the animal nursery with its cuddly critters, even an attention seeking baby goat, were aninals that could also be purchased and taken home too. For some of the lucky children who had suitable patches of land and space, getting to take something cuddly home was way better than a quick giggle at their antics over the fence or a snatched pat through a cage.